"S&P 500 teeters on edge of a 'death cross,' and one key level could determine its next move"
It's amazing to me the amount of garbage that gets generated to fill the airwaves of CNBC, not to mention other "news" sources. As good Bogleheads, I suggest we all stay the course! I think it is useful to stay on top of financial news. For example, GE's troubles are a warning sign. Additional signs from other companies might make a Treasury Fund more appealing than a general Bond Fund. Give up a little yield and sleep better. Or when my company's CFO resigned, I lightened up on my company's stock. In this case, there was no hidden financial problems, but thought it was a prudent move in a non publicly traded stock. the first example is public information - if you think you're fast enough to act on it before the market corrects you're kidding yourself. The second example is more "insider information" on a non-publicly traded company. It could work, if the person buying your shares doesn't have the same info that you do. We need to always remember that you aren't trading against some inanimate object, you are trading against other human beings. And if the other human knows as much, or more, than you do about the company or the market then you are most likely on the losing end. Unfortunately you can never know how much the other person knows on the other side of the trade but we do know that the vast majority of time it is an institutional trader on the other side w/ the best computers, teams of economists/phDs, and every other advantage that you don't have. Point being - do not for one second think you have a leg up on the market. you don't. you may have gotten lucky from time to time on a trade but that is bound to happen by pure chance. I think it's best to keep this stuff on CNBC and off the forums. Only on the financial pages of respectable publications do you see the equivalent of the ravings of a schizophrenic blogger. Actionable: Change channels. Better yet, turn of the tube. Michael Kahn at Kiplinger wrote: Pundits are no doubt sharpening their pencils over the prospect that the Standard & Poor’s 500-stock index is about to form a technical pattern called a “death cross.” And a death cross, as the name would suggest, should be quite deadly for stocks. Who's right? Beats me. So I guess I'll just stand here. I am INCREDIBLY thankful that I have found this website because if it wasn’t for the great folks like livesoft, Taylor, Rick Ferri etc. I would still have my money with an advisor charging me too much money and freaking out over this latest “crash”. I even chuckle at my coworkers who have been lamenting this latest pullback and are selling stocks so that they can buy in when we hit the lows. Because of you all, I continue to invest weekly/monthly and yawn at all this crazy stuff I see on the news and various websites. Thank you. We need to put this into proper context. First, add lots of reverb (big echo chamber). Next, us a low, monotonous voice to say “DEATH CROSS”. As someone who doesn't watch financial news, the only time I hear about stuff like "DEATH CROSS" is on these forums. Great, now I can't get that Alanis Morissette song out of my head. Mixed bag. Ignore the asset allocation section. Before you laugh off things like the rate curve inversion and major index death cross, you probably should educate yourself as to what they mean, because these are things a lot of investors take very seriously and because they do, they have an impact on the market. There are some silly indicators like "The Hindenburg omen" which are just fluff. But other things, including actual rate curve inversions are not. Once you understand what people in the investment world are talking about you may well dismiss what they have to say. Most of it is click bait. But some of it is not. Knowing the difference matters, especially for those near or in retirement who don't have the luxury of waiting 10 or 15 years for their stock investments to return to where they are now. I listened to my father’s financial advisor from TIAA call the other day. He said he was “obligated” to reach out because my father’s employer was paying him for that service, and mentioned that my father’s portfolio was not taking full advantage, including of for example the “Real Estate” fund. Next time he calls I’m going to talk to him, and tell him that if he really thinks his portfolio changes are better than the current portfolio, then he (or I) can make an anonymous post on a website called https://bogleheads.org, send each other the link, and see if the members agree that it’s a good idea. If it is, we will go ahead and implement it. If it weren’t for the education from Jack Bogle, Taylor Larimore, and others here, I would be completely lost in the dark. I was so thankful to all Bogleheads after hearing that call. Knowledge is power. If it weren’t for you guys, my father would be easily out 1% of his portfolio per year. I'm not amazed. I think the financial networks are 'informally' in cahoots with the financial advisors to stroke the FUD. How many would tune in to listen to the same message (three fund portfolio, stay the course ) every day? They like to make it all very dramatic and catastrophic. Showbusiness. For alot of people, the more you learn about investing, the dumber and broker you become. Sounds like a bad '70s movie. "In a world where gangs run wild and justice turns a blind eye, one priest must put down his collar and make a stand. Charles Bronson is Father Brock McSteele in... DEATH CROSS!" I saw this movie. There is nothing to worry about. 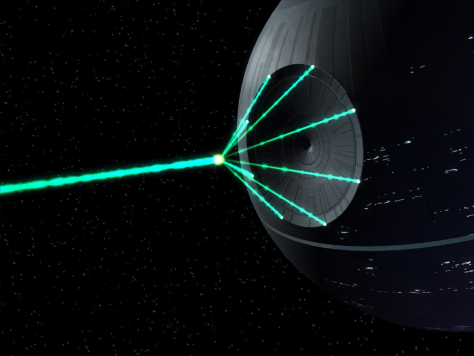 The death star is still under construction and has an inexplicable weakness that can be easily exploited by the rebels. Remember CNBC primary business is to sell ad space. Ad space revenue is dictated by eyeballs. All media outlets have found that bad news stories gets more eyeballs than good ones. The economic incentives of the media businesses are to promote bad news stories above all else. The presenters literally get bigger bonuses for scaring you. *Sigh* I miss Don LaFontaine. That sounds like an AWESOME '70s movie! So, with the market drops, when distributions are made, should we expect another drop in the Vanguard Index funds? I'm anticipating more tax-loss harvesting to occur. When it comes to investing, all the information you need to know can be put on an index card. Technical terms like death cross, convergence divergence, bollinger bands, and dead cat bounce are terms that you can leave to the technical analysis experts. These chart monkeys dont make their money from investing, they make their money from selling financial products. Having a high savings rate, a reasonable asset allocation, and sticking with a plan through thick and thin is about all you need to know to be a successful investor. That's why you need only a small amount of information about investing and a large amount of information about behavioral economics and behavioral investing. The mistake people make is thinking they need to know everything about investing and don't understand their own hard wired psychology, loss aversion, etc and shoot themselves in the foot until they run out of money . averagedude wrote: When it comes to investing, all the information you need to know can be put on an index card. Technical terms like death cross, convergence divergence, bollinger bands, and dead cat bounce are terms that you can leave to the technical analysis experts. These chart monkeys don't make their money from investing, they make their money from selling financial products. Having a high savings rate, a reasonable asset allocation, and sticking with a (low cost) plan through thick and thin is about all you need to know to be a successful investor. Thank you for very good advice. Death isn't good or bad; it just is. Death Cross - Isn't that when one squiggly line crosses over another? I wonder what's worse - the Death Cross or the Hindenburg Omen?? The Hindenberg Omen occurs when both new 52-week highs and 52-week lows exceed 2.2 percent of NYSE traded issues, indicating large divergence. The Omen has appeared before all of the stock market crashes of the past 25 years. The first observation was August 12, and this has been confirmed by a second Omen on Friday, August 20. On July 6, the Death Cross appeared, in which the 50-day moving average crossed below the 200-day. After a brief rally, the market is now again on a downtrend and the 200-day moving average is rolling over. Is anybody getting scared yet? The Hindenburg Omen is still good for another ten days. I mean bad for another ten days. I'm not giving up hope... er... I mean... I'm not giving up fear. On October 4th, the Hindenburg has a rendezvous with destiny! Sorry, we had a brief power outage. Charley is going to connect us now to the bridge of the Hindenburg, again. Bluth: Okay, GDC is good. Lehmann: Got a good S-II, gang. Bluth: Okay. Now we'll straighten out our problems here. I don't know what happened; I'm not sure we didn't get hit by lightning. Ladies and gentlemen, the Hindenburg was just hit by a terrific bolt of lightning, a very dangerous situation due to the hydrogen, but there has been no damage. It is approaching the mooring post... it is moored. The sky has cleared. The sun is out. I can hear the Lakehurst High School Pipe and Drum Corps playing Beethoven's Pastorale symphony, as everyone is celebrating another yet safe and anticlimactic voyage of this magnificent aerostat. Tune in again when we cover the next arrival of the Hindenburg, which will take place right here in beautiful Lakehurst, New Jersey, on May 6th, 1937. Confirmed Hindenburg Omen on 8/20 - anybody watching? Or that it matters, but I read a technical analysis today on the death cross. Essentially, it has been a precursor to every major downturn. However, in the last 50 years, returns after the death cross were, on average, BETtER than the opposite, which is the golden cross. The death cross of today is said to reflect “past” performance and may actually signal the bottom. Will have to differ with you on this one. There are plenty of inanimate objects trading, they are called computers, specifically the high speed trading algorithms that have been developed. Second - you have no idea why someone else is selling. it does not necessarily mean they have more information than you or you are on the losing side of the trade. How do you know the "vast majority of the time it is an institutional trader"? based on what? why isn't the other side of the trade the guy down the street? There is no way to know. If you are buying a stock at $100 it could be from someone who bought it at $50 and is cashing out to pay for college or from someone who bought it at $120 and is cutting their losses. No way to know. I'm pretty sure I've seen some variant of this headline every month for 4 years. Seems to me that the stock market often drops or stagnates for a while before it recovers, then eventually rises to new heights. With that constant risk of potential loss, the reward is more than for steadier investments. Over the long term, those temporary losses are advantageous to patient, less greedy retirees who also have some bond fund holdings to spend from, when necessary. For workers, buying shares at reduced prices is good, if you can keep your job during and after those crashes. Thus the more public angst, the more return for long term investors. We should thank the media for forecasting that the markets are due for another crash. We Are Teetering on the Edge of A DEATH CROSS the usual uncertainty. Recessions happen. If not now, then sometime. Yield curve inversions and death crosses and falling home sales are pretty good leading indicators of recessions. Stock markets often go down during recessions. Denying multiple recession indicators is probably whistling past the graveyard. Past performance is not an indicator of future performance, but future and past usually rhyme. That said, is anything actionable here? Maybe, depending on what your IPS says. My IPS says nothing about death crosses. So I’m standing pat until my IPS says to do something. People shouldn’t laugh off information of any kind — that’s just arrogance. The S&P500 death cross is a rare event that is taken seriously by a lot of very smart people. I’m not sure why people would laugh that off. With a "disco" (Bee Gees?) soundtrack. Let me propose a different point of view: it's not arrogance, it's humility. Since nearly all of us are amateur investors, we know we have little chance of separating the wheat from the chaff in investment news, though we are fairly certain that there is much more chaff than wheat. We also know that we don't stand a chance of beating professional traders at their own game. And that's what trying to act upon things like a death cross, cup & handle, head & shoulders top or bottom, Elliot Waves, etc. is attempting to do -- beat the professionals at their game. So we play our game instead. That game is saving money and investing for the long term in a low cost diversified portfolio. And ignoring the noise in the financial media. And yes, often making fun of it. Because there is nothing we can do with that "information" other than reduce our long term returns by trying to time the market. Stats from that iMarketSignals Death Cross report linked above. For 32 DC events, the S&P500 lost value over a 3-month period to the date of the DC, almost a 100% probability. The historic probability for the S&P500 to be lower after 3 months is only 44%. For 20 DC events, the S&P500 lost more than 5% over a 3-month period to the date of the DC, a 60% probability. The historic probability for the S&P500 to be more than 5% lower after 3 months is only 18%. For 29 DC events the S&P500 lost value over a 6-month period to the date of the DC, an 88% probability. The historic probability for the S&P500 to be lower after 6 months is only 37%. For 13 DC events the S&P500 lost more than 5% over a 6-month period to the date of the DC, a 39% probability. The historic probability for the S&P500 to be more than 5% lower after 6 months is only 22%. There were ten recessions since 1950. Six recessions were preceded by a DC and for the other four the DC occurred at, or near the beginning of the recessions. There was never a recession without an associated DC. Way to go to pro-long the garbage news cycle! The DEATH CROSS is fully operational. It seems to me that this answers the wrong question. I'm not too concerned how many recessions included a death cross event. Isn't it more important to know how many death cross events there were and how many led to recessions (or bear markets)? If death crosses predicted 32 of the last 10 recessions, I don't feel that this is a helpful predictive tool. I may have misunderstood your post, but didn't you reference at least 32 death cross events? If 22 (or many more?) of them didn't lead to anything, death crosses may not be so bad. Again, I admittedly may have misunderstood something.